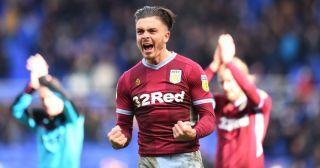 Birmingham City’s season appears to be going from bad to worse, and Aston Villa star Jack Grealish seems to be enjoying it. The Blues suffered defeat in the Second City derby earlier this month, and have now fallen to four consecutive losses in the Championship to all-but end their promotion hopes. It also came after they were widely slammed as a club by supporters, pundits and the like after the disgraceful scenes during the derby in which Grealish was attacked by a fan on the pitch. However, it appears as though their downward spiral is set to continue as Sky Sports note that they have been given a nine-point deduction from the EFL for breaking FFP rules. That deduction has seen them drop to 18th place, as they now face a relegation battle given they sit just five points above the bottom three with eight games to go. While Grealish managed to get his revenge immediately with the winner in the derby, he has seemingly also taken great pleasure in the report that Blues are set to be hit with the damaging disciplinary action by ‘liking’ a tweet from Sky Sports reporter Rob Dorsett on the matter, as seen in the image below. However, he has since unliked it perhaps in a bid to avoid attracting a negative reaction from some, but fair play to him given what he experienced at St. Andrews and his ties with Villa. Time will tell though if Birmingham City can avoid relegation to ensure that this season doesn’t turn into a complete disaster, having once looked very promising with promotion a genuine target.